IVANO CAFOLLA KNOWS a thing or two about the pains hospitality businesses can face when it comes to bookings, reservations and getting more people in the door. His family’s background is in the trade and from a young age, he worked as a kitchen porter and waiter to gain an understanding of every role in the chain of command in running a restaurant or bar business. Previously he headed up nightlife promotion brand Afterdark and was running his own bar, No.5 Vinoteca, in Dublin city centre. Here he encountered a recurring problem with the limits of reservation software, which formed the idea for his latest endeavour Zazu, a venue search, booking and payments app. “While there were good reservation diaries like ResDiary and OpenTable, there was no one bringing new business. That was very much a (business-to-business) model,” he says. Zazu, founded in 2016, is an attempt to address his own frustrations and spread the solution around the industry. Through his contacts from running Afterdark, Cafolla had access to a large consumer database that he could use to kick-start what would become Zazu, but that presented a few hurdles around data protection. “(Afterdark) was never incorporated so we simply incorporated Afterdark as Zazu because we came up with this idea so we were able to take the database cleanly into there,” he explains. “We actually have quite a strong database for a startup, about 100,000 people. That’s a blend of social media (profiles) and emails. The app registers all of the user’s information like name and contact details. When a user wants to browse restaurants and bars in an area – the app geolocates them – they can select a venue and book there and then. “When the consumer makes a booking with a venue, the venue has all the customer’s details straight away,” Cafolla says. Zazu’s business model is two-fold. It charges venues a monthly €100 fee to use the platform for booking and receiving payments. It also includes a function for groups and work nights out to split the bill through the app. Zazu takes a 0.5% charge of that bill. Cafolla says that this helps cut down on confusion for groups, especially work functions that may need to present receipts for various purchases to claim back expenses. 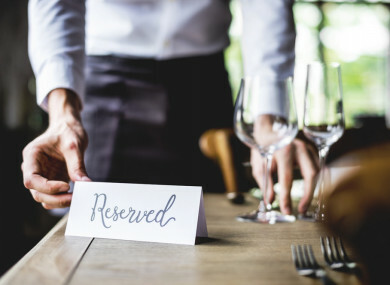 The subscription charges of €100 to restaurants, Cafolla says, is just at the right spot for restaurant managers, along with the payments function, but “if it gets any more it’s not justifiable”. To date, Zazu has signed up 59 venues and the startup is gradually bringing restaurants live to the network. It’s working with Paddy McKillen Jnr’s Press Up Entertainment group, which own several bars and restaurants in Dublin such as The Dean hotel and Captain America’s. While focused on Dublin initially, Zazu went to the UK to raise its first significant investment for its venture. It secured £210,000, around €250,000, from one investor, Damian Cox, the chief executive of billboard advertising firm Wildstone. Cafolla tells Fora that he went to the UK to raise money so it could avail of its Seed Enterprise Investment Scheme (SEIS), a tax incentive programme for small business. “We registered ourselves as a permanent establishment up (in the) North. We effectively classify then for SEIS,” Cafolla says. The UK scheme, he says, is more favourable than the Irish equivalent Employment Incentive and Investment Scheme (EIIS) – a common complaint that has been made in Ireland’s startup community. Zazu previously raised a very early injection of €50,000 from investors that included John Moore, founder of medtech startup 3D4Medical. While it’s signing up mostly Dublin-based businesses at the moment, it’s also looking further afield. With funding in tow, Zazu will start hiring more people. Currently Cafolla has just one staffer in Northern Ireland who will be looking after sales for the market. The UK is the next logical step, he adds, especially with its Britain-based investor’s backing and network. Email “Booking app Zazu wants to solve the 'age-old' problem of awkward restaurant reservations”. Feedback on “Booking app Zazu wants to solve the 'age-old' problem of awkward restaurant reservations”.